No-Bake Fruit Balls are a chewy snack with natural sweetness from fruit and honey. Almonds are on the inside and coconut on the outside. Combine all ingredients except coconut in the bowl of a food processor fitted with a knife blade. Process until ground. Shape mixture into 24 balls. 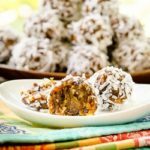 Roll balls in coconut flakes. Chill balls. Keep balls chilled in a sealed container when not serving.